Every day, Watch This offers staff recommendations inspired by the week’s new releases or premieres. This week: Celebrate Cold War Week at The A.V. Club with some stellar movies about that decades-spanning conflict. Clint Eastwood marries Bressonian character drama to Star Wars sci-fi action in Firefox, perhaps the strangest entry in the illustrious star’s canon. This Cold War espionage saga concerns American fighter pilot Major Mitchell Gant (Eastwood), who’s sent undercover into Russia to steal a top-secret fighter jet known as the Firefox that’s controlled by aviator’s thoughts. Eastwood’s film spends its fascinating first hour presenting a spartan vision of spy games centered on a nearly mute protagonist. 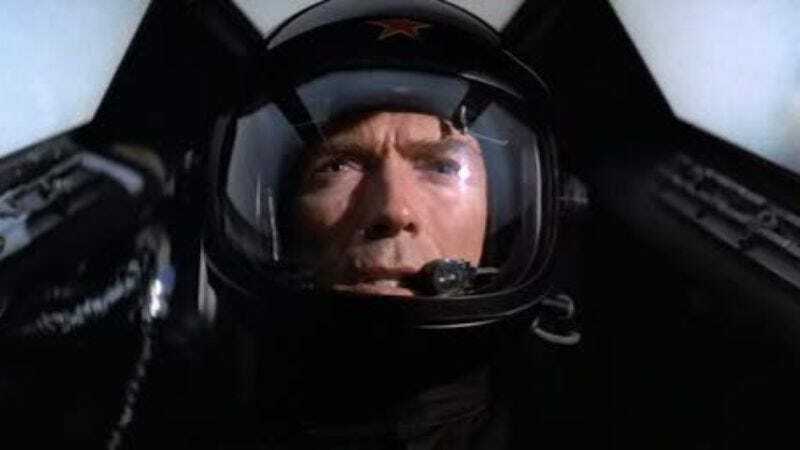 Even for an actor famous for playing strong, silent types, Eastwood barely speaks more than a few lines during early passages in which he’s recruited for his mission—an undertaking complicated by his PTSD-esque flashbacks to Vietnam memories of a girl being set ablaze—and then infiltrates the communist nation. Gant is plagued by bygone horrors, and forced to “become” Russian in order to complete his task, eventually “thinking” in Russian in order to man their craft. He’s a cold, remote man of action whose identity seems hopelessly torn between the present and past, West and East. Such notions underscore the film’s opening half, which is marked by Eastwood’s clean, sharp dramatization of numerous exposition-heavy incidents in which Gant narrowly avoids detection by the KGB, who are hot on his trail. Once he succeeds in acquiring the super-plane, Firefox becomes a more rote adventure intent on providing some George Lucas-style aerial suspense—replete with Gant donning a black helmet seemingly designed to recall Darth Vader’s—that never materializes, thanks in large part to so-so special effects and an overarching sense that Gant’s triumph is preordained. Nonetheless, if the conclusion is never in doubt, the story serves as one of the director/actor’s earliest attempts to wrestle with his own violent cinematic legacy, with its later sequences providing further opportunities to watch Eastwood strip his iconic squint-and-snarl persona down to its withdrawn, inaccessible essentials—a process that reveals the fundamental, soul-crushing confusion and emptiness wrought from war, and the killing it inevitably requires. Availability: Firefox is available on Blu-ray and DVD from Netflix or possibly your local video store/library. It can also be rented or purchased from the major digital services.